Welcome to Nightingale and lamp. 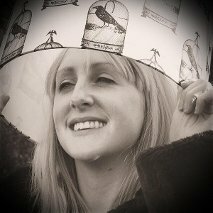 Handmade lampshades made in Sheffield, England. Nightingale and lamp began in the summer of 2011. I wanted a bold colourful lampshade for my little boy's room but couldn't find anything right or affordable for my needs. Then I thought about making my own lampshade and fell in love with the process. My mission now is to brighten up peoples homes with colourful bespoke lampshades at an affordable competitive price. I up-cycle used lamp bases and can strip down old shades and refurbish them to give them a new lease of life, The PVC shade lining I use is flame and heat proof. Each and every lampshade is made with love and care. I hope that you love them too! No job is too big or too small so please get in touch. Hello there! This is me, Hayley Nightingale. Florence Nightingale was known as the lady with the lamp, I'm known as the lady with the lampshades. I'm mother to two children, Herbie and Tillie, . I am a fabric addict and always browsing on-line fabric shops and vintage markets for suitable new materials. I love colour, all things unusual and am a child at heart.